I'm currently working at a coffee shop. It's not necessarily what I expected I would be doing post-graduation. There have been many days where I've questioned the purpose of my life while wiping coffee-stained hands onto my blue jeans, picking up yet another pitcher of milk, and watching the bubbles rise and then disappear into the white whirlpool. Michael wants his daily medium latte, and I get to be the one that pours foamy milk into caramel-colored espresso, form a decent rosetta, and hand it over with a smile. I know that I won't be here forever. I'm finishing school and a new wedding photography season is coming up. Even though it's short-lived, I don't want to look back on this time as a waste. How can I make these countless interactions and mindless tasks mean more? I'm so much more than what I do, and I want that to be apparent in the way that I live. Career, vocation, purpose... It's a lifelong journey. I will admit that I used to think it was an educational one. You get your degree, figure out who you want to be, and the rest just sort of... well... happens? Fortunately, I'm learning that's most definitely not the way it is. If it was, we wouldn't be nearly as strong or our stories nearly as interesting. I'm trying to take what I have and where I am, and let it teach me something. Something that is not merely wasted time. Something that will be valuable to who I am now and where I am going. How will we get anywhere if we don't learn from the seemingly insignificant spaces in between the big moments? I guess the reason I started talking about all of this is because of apple carrot pecan muffins. The chef at the coffeeshop makes them, and this recipe was inspired slightly by her brilliance. I don't know what she puts in hers besides apples, carrots, and pecans, but I wanted to make my own healthy version. I used gluten free flours, and they are only sweetened with a banana and a small amount of maple syrup. 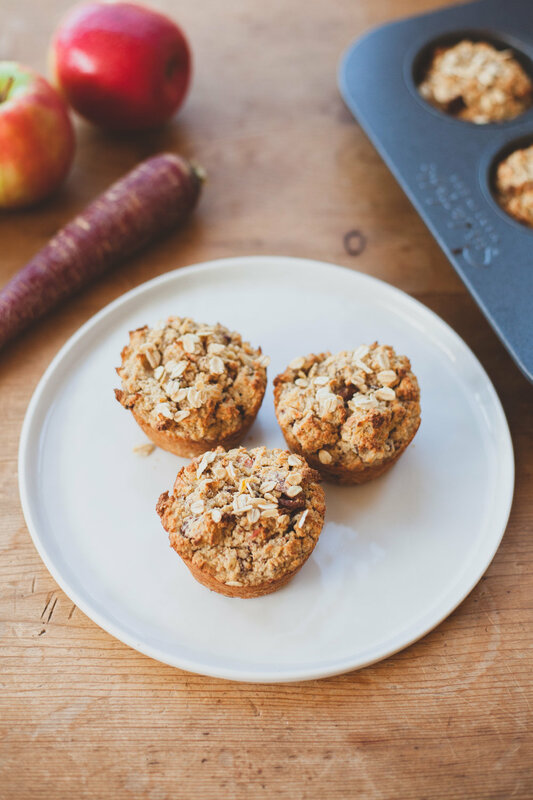 These muffins are guilt-free and full of good things for you. The absolute best part is that they actually. taste. amazing. They're not dry, bland healthy muffins. They are moist, sweet, and flavorful healthy muffins. You have got to try them. In a separate bowl (or the same bowl), add the flours, cinnamon, salt, baking powder, and pecans. Stir until well combined. Scoop into a greased muffin tin. Bake for 25-30 minutes.